SUBHEAD: A digital justice project is putting people online and providing technology training in Detroit. Image above: Dwight Roston is drilling on the roof of a home in Detroit’s Islandview neighborhood on the city’s east side. From original article. Dwight Roston is part of a team that is setting up a wireless internet connection. The home is just one of 150 designated households in the city to receive free internet service by the end of the year. 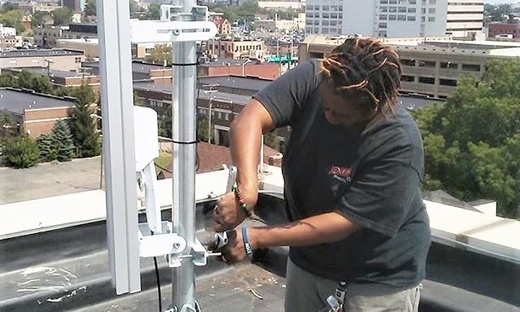 In 2016, a coalition of media, tech, and community organizations launched the Equitable Internet Initiative, a project that will result in the construction of wireless broadband internet networks across three underserved Detroit neighborhoods. Leading the initiative is the Detroit Community Technology Project (DCTP), a digital justice project sponsored by Allied Media Projects. Each network will provide wireless internet service to 50 households per neighborhood, according to Diana Nucera, executive director of DCTP. “During the economic and housing crisis, communities had to fend for themselves,” Nucera says. Detroit has one of the most extreme digital divides in the country, with more than 60% of low-income residents without broadband in their homes. According to a recent report from the Brookings Institution, residents in low-income or rural neighborhoods are the least likely to have broadband subscriptions. Even discounted municipal or corporate broadband subscriptions, if available, are not necessarily alternatives for many families. After all, affordability is relative. Last year, the United Nations declared internet access a human right. But like running water, which was also declared a human right by the U.N., it is considered a paid service in the United States. In 2016, a U.S. federal court ruled that the high-speed internet service can be defined as a utility, such as gas and electricity. And as is the case with access to most utilities, there is a large gap between those who can afford internet service and those who cannot. This digital divide, which includes lack of access to computers, is a barrier to success in day-to-day life tasks, so much of which is done online—from paying bills and other financial management to obtaining voting information, from completing homework to communicating with a child’s school. The coalition raised just under $1 million from local and national foundations to finance the Equitable Internet Initiative. Funds were used to hire employees, buy equipment, and internet bandwidth. They purchased three discounted wholesale gigabit connections from Rocket Fiber, a Detroit-based high-speed internet service provider. Their contract with Rocket Fiber allows the coalition to share its connection with the community—a provision not allowed by other companies. Each neighborhood is represented by a partnering organization, whose locale is used as the central connection hub for service. In Islandview, it’s the Church of Messiah, a non-traditional Episcopal church. An antenna sits atop the roof and receives a point-to-point wireless connection from Rocket Fiber, which is then shared to the 50 designated households. They mount CPE (customer premise equipment) dishes on top of the homes, which receive a signal from the hubs. Finally, they run cables from the dishes to the routers inside the homes. Roston, a digital steward, says the work was foreign to him. So far, he’s helped with getting 19 of the 50 designated households in the Islandview neighborhood online. Wallace Gilbert Jr. is responsible for recruiting Roston. Gilbert is the assistant pastor of the Church of Messiah, and he’s also a digital steward trainer. He has worked in tech for 30 years and for the past several years has been teaching neighborhood youth to build and repair personal computers to take home. Digital literacy is among the needs of the community that the church provides. It was then, Gilbert says, he realized that the computers were useless if the youth couldn’t access the internet. The Federal Communication Commission’s Broadband Task Force reported that approximately 70% of teachers assign homework requiring access to broadband. According to the same report, 70% is also the rate of school-aged children in Detroit who don’t have internet access at home. A mission of both The Church of Messiah and the Detroit Community Technology Project is to increase young people’s access to and facility with technology. This is why Gilbert and the church joined the Equitable Internet Initiative. Nucera says the three-neighborhood project is about 50% complete. The coalition’s contract with Rocket Fiber expires next year, but another internet service provider has agreed to extend service for an additional three years. The next and final phase of the project involves developing a business model so that the residents will continue to have internet after the second contract ends. This element of self-determination is also motivating, Roston says. “You don’t ever want to give somebody something that they did not have and couldn’t do without and then take it away from them,” he says. The project is a model for any neighborhood, though, even at a small scale.